On this card, I choose a mixture of elements to make my design come together. 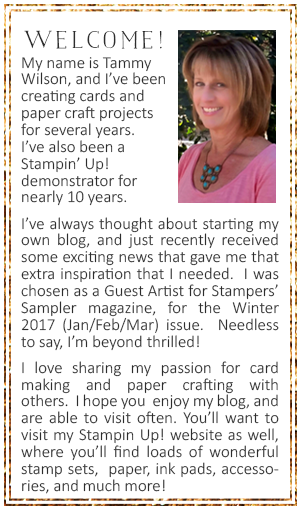 I then stamped a border of vines (using the Botanical Bliss stamp set and my Early Espresso Classic Stampin’ Pad) on a strip of Wood Textures Designer Series Paper (…vintage), and layered that on a larger piece of Whisper White Cardstock. After adding some Night of Navy Gingham Ribbon, I used a few Stampin’ Dimensionals to adhere add this panel to a Night of Navy (…traditional) cardbase. I used my Early Espresso Classic Stampin’ Pad along with a sentiment from the P.S. You’re the Best stamp set (…whimsical), die cut it with of the Stitched Labels Framelits, and used some Linen Thread was used to tie it onto the card. I also tucked in a bit of Silver Mini Sequin Trim. The Lovely Floral Textured Impressions Embossing Folder (…romantic) was used with some Soft Sea Foam Cardstock, and then die cut with one of the Stitched Shapes Framelits. It’s hard to see in the photo, but I also used a small piece of a Stamping Sponge to add Whisper White Craft Ink to highlight the embossed area, and then used a Wink of Stella Glitter Brush to add a bit of sparkle.) One of the Layering Squares Framelits was used to create the Whisper White scalloped square underneath. For my last couple of details, I added some wooden leaves from the Frames Elements (…trendy) and then just a couple of Rhinestone Basic Jewels. TIP: When sponging ink onto your cardstock, use a light touch and add it sparingly at first, then add additional layers of color as needed.